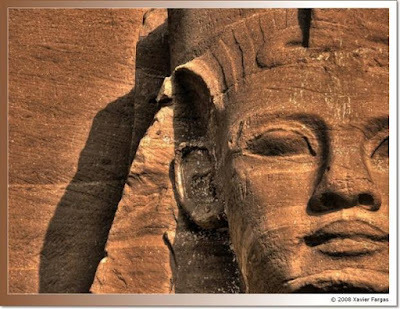 There is a popular myth still existing in the minds of many that Ancient Egyptians and their culture were introduced into Africa through Asia. But this is a modern myth, born of the racism of the last few centuries. It was largely disseminated by a highly regarded Egyptologist, Flinders Petrie. Petrie was responsible for mentoring and training a whole generation of Egyptologists, including Howard Carter (known for discovering Tutahkhamen's tomb.) 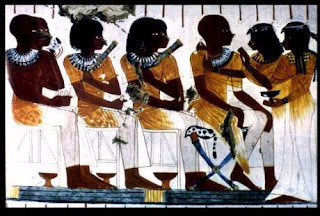 Petrie contended that the culture of Ancient Egypt was derived from an invading Caucasian "Dynastic Race" which had conquered Egypt in late prehistory and introduced the Pharaonic culture (Trigger, 1994). Petrie also happened to be a dedicated follower of the pseudo-science of Eugenics. 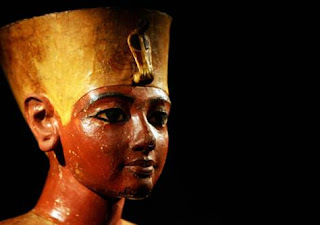 Petrie claimed that his "Dynastic Race", in which he never ceased to believe, was a "fine" Caucasian race which entered Egypt from the south in late pre-dynastic times, conquered the "inferior" and "exhausted" "mulatto" race which then inhabited Egypt, and slowly introduced the finer Dynastic civilization as they interbred with the inferior indigenous people (Silberman, 1999). As astutely pointed out by John Henrik Clarke, it's difficult to believe that Caucasians could have brought civilization to ancient Egypt when at that time they had no comparable civilization from which to bring it! Nevertheless, thanks to Diodorus Siculus we can get a glimpse of how the ancients themselves understood their own origin. 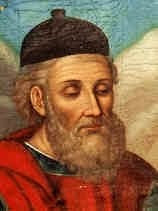 Diodorus Siculus was a Sicilian Greek historian who lived from 90 to 21 BC. He wrote, a world history in 40 books, ending it near the time of his death with Caesar’s Gallic Wars, entitled Bibliotheca Historica ("Historical Library"). Below is an account from Book III. "Now the Ethiopians, as historians relate, were the first of all men and the proofs of this statement, they say, are manifest. For that they did not come into their land as immigrants from abroad but were natives of it and so justly bear the name of "autochthones" (sprung from the soil) is, they maintain, conceded by practically all men..."
"And they say that they were the first to be taught to honour the gods and to hold sacrifices and processions and festivals and the other rites by which men honour the deity; and that in consequence their piety has been published abroad among all men, and it is generally held that the sacrifices practised among the Ethiopians are those which are the most pleasing to heaven." And he was followed there by all the gods. "They say also that the Egyptians are colonists sent out by the Ethiopians, Osiris having been the leader of the colony. For, speaking generally, what is now Egypt, they maintain, was not land but sea when in the beginning the universe was being formed; afterwards, however, as the Nile during the times of its inundation carried down the mud from Ethiopia, land was gradually built up from the deposit. Also the statement that all the land of the Egyptians is alluvial silt deposited by the river receives the clearest proof, in their opinion, from what takes place at the outlets of the Nile; for as each year new mud is continually gathered together at the mouths of the river, the sea is observed being thrust back by the deposited silt and the land receiving the increase. as "popular" (demotic) is learned by everyone, while that which is called "sacred" is understood only by the priests of the Egyptians, who learn it from their fathers as one of the things which are not divulged, but among the Ethiopians everyone uses these forms of letters. Furthermore, the orders of the priests, they maintain, have much the same position among both peoples; for all are clean who are engaged in the service of the gods, keeping themselves shaven, like the Ethiopian priests, and having the same dress and form of staff, which is shaped like a plough and is carried by their kings..."